Video clips from the event Celebrating Dr Sarwar, DSF, Aug 8, 2009, at the HRCP auditorium in Lahore, organised by medical doctor Dr Farrukh Gulzar, Ammar Ali Jan of the Labour Party Pakistan (LPP) and friends of Dr Sarwar, now uploaded to the web. Below, the respected journalist Minhaj Barna speaking at the occasion. Other speakers included Abid Hasan Minto, I.A. Rehman, Hameed Akhtar, Zaman Khan, Afzal Tauseef, and others. For all the clips in this series, see this playlist. Scan of a report published in Dawn, Lahore edition, Aug 9, 2009 (not available on the website). Correction: As mentioned in the press release sent out earlier, the event was organised by ‘friends and admirers of Dr Sarwar and his legacy’. The initiator of the event was Dr Farrukh Gulzar, working in his individual capacity as an admirer and follower of Dr Sarwar, the HRCP (Husain Naqi and Zaman Khan, use of the auditorium and staff), the Labour Party Pakistan (Ammar Ali Jan and Farooq Sulehria, who also published a booklet compiling articles related to Dr Sarwar and the 1950s student movement), and Dr Sarwar’s family. The Awami Jamhoori Forum was not involved in the organisation, nor is Dr Farrukh Gulzar a member of the AJF as the report states. LAHORE: Famous student leaders of their time paid tribute to the pioneer of progressive student unionism in the country, late Dr Mohammed Sarwar at the Dorab Patel Auditorium of the Human Rights Commission of Pakistan (HRCP) on Saturday. Known progressive leaders and professionals like Minhaj Barna, Hameed Akhtar, IA Rehman, Hussain Naqi, Abid Manto, Dr Mubashar Hassan, Prof Afzal Tauseef, Moneeza Hashmi, Saleema Hashmi, Saeeda Diep, Zaman Khan, Dr Farrukh Gulzar and many others shared their experiences and friendship with the former student leader. Sarwar’s wife Zakia and his daughter Beena were also present. The speakers said Sarwar pioneered the Democratic Students Federation (DSF) in the early 1950s in order to give the students a platform to make themselves heard. The DSF played a vital role in developing a progressive ideology in the country, and later became the base of a number of other student organisations like the National Students Federation. Barna said the DSF, labour unions and the society of progressive writers were three forces that rendered remarkable sacrifices to rid the society of imperialism and it was the duty of the next generation to honour their sacrifices and envision their dreams. Mere guardians: Akhtar said people like Sarwar gave their lives to bring a change in society but the next generation acted as if was a mere guardian of those ideals (majawar). He said the struggle and ideology should be carried forward. Building futures: Rehman said when Pakistan came into existence, the people of that time thought about freedom and prosperity. “The farmers thought that there would be an abundance of water for their fields and countless resources. But a boy from Allahabad travelled all the way to Karachi and became busy in thinking about building the future of the country. His name was Dr Sarwar and he dedicated his whole life to the purpose,” he said. Naqi and Manto said Sarwar successfully led his students union against all odds and continued to do so despite facing torture, persecution and crackdown by governments. Lahore August 6: A Reference for the pioneering student leader Dr. Muhammad Sarwar will be held here at HRCP’s Dorab Patel Auditorium on Saturday August 8 at 5 p.m.
Dr. Muhammad Sarwar was amongst founding leaders of the Democratic Students Federation (DSF) and the All Pakistan Students Organisation (APSO). He was also instrumental in the formation of Inter-Collegiate Body of Karachi (ICB) which along with DSF spearheaded the students struggle for the acceptance of students charter of demands in 1953. Twice elected to the office of General Secretary (national), Pakistan Medical Association (PMA) that continues to play a leading role in the affairs of medical profession, Dr. Muhammad Sarwar was amongst those who had formulated a people-friendly health policy. It was unfortunate that the policy, duly presented to the concerned quarters by the PMA, remains unimplemented. Coinciding with his Birthday, the Reference for Dr.Muhammmad Sarwar, will be addressed by Mr. Hameed Akhtar; Mr.I.A. Rehman;Mr. Abid Hasan Minto;Dr. Haroon Ahmad, Dr. M. Ilyas, Prof. Afzal Tauseef, Ms. Salima Hashmi; Dr.Izhar Chaudhry General Secretary PMA,Punjab, Mr.Farooq Tariq LPP leader,Mr.S.M. Naseem former editor “Students’ Herald”, Zaman Khan, Ammar Ali Jan, Dr. Farrukh Gulzar and Zakia Sarwar. The Reference will be followed by tea. Later, participants may join discussion to be facilitated by Mr. S.M. Naseem, Beena Sarwar and Ali Cheema. I put my stamp of approval on Doc Sarwar as prospective bridegroom for my friend when she sheepishly introduced him to me in June 1962. Abba and I were on our way to Moscow on the Llyod Triestano Shipliner – he to receive the Lenin Peace Prize and I to go on to art school in England. It was a rushed meeting but my friend was anxious – the tall good-looker seemed an OK bet as far as I could see, so I gave him a nod. I suspect he knew he was being appraised … the approval stood the test of time. So how does one encapsulate a lifetime of intrepid friendship, the good humour, the intense partying and talking, and the occasional gleeful ‘gheebat’ about the world in general. Of course there was always this locking of horns with Shoaib Hashmi – as to who was better at getting out of doing the darndest thing around the house. How one could get the air-conditioner serviced whilst sitting in the armchair and reading the newspaper! How to get the water tap running whilst sipping afternoon tea, and watching cricket on T V. How to shop for the best mangoes in town long distance and, most importantly, how to sort out the country’s problems in each other’s company late into the night. Never passing up the chance to be caustic about those bolshies who thought they were actually doing it: they came in for some extra flack. In the words of dear Billum Apa “Saari saari raat revolution karte hain aur saaraa saara din sote hain“. One could never accuse Doc of being lax about the real things – work – motivation and more work. 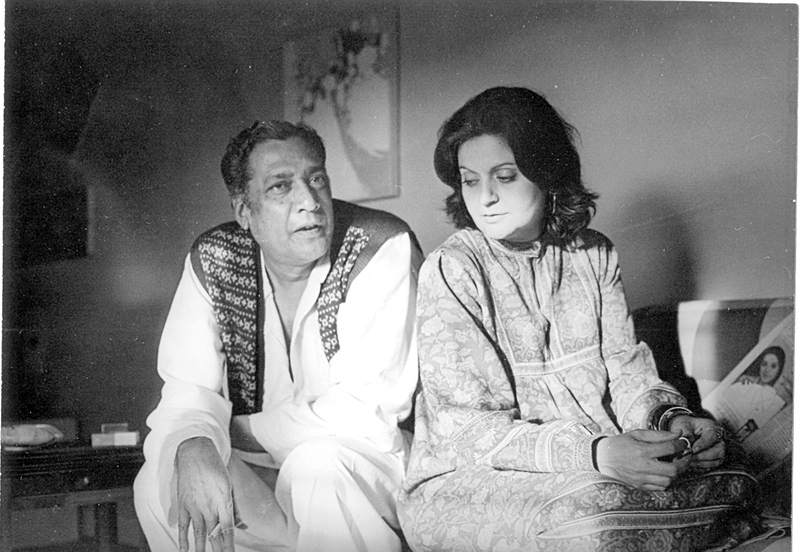 As a comrade, his relationship with Abba was an unspoken clear bond based on a shared understanding of the universal struggle for a just human order – Faiz wrote something for his other pal and comrade, Major Ishaq. He would have said the same for Doc.